This was one recipe I picked up on Pinterest that I knew I had to try. I have never been a fudge maker at Christmas. Sugar Cookies, Shortbread and Nanaimo Bars are my thing (can you tell I'm from BC?) But I love Egg Nog. It's my little treat to sip after the kids are in bed in December. OH MY GOODNESS! This fudge was so delicious! (I'm not one to type in capitals so you know I mean it!) I give credit to the originator of this recipe at Rook No. 17 - thank you! 1. Prepare your pan by lining bottom and sides with foil. Allow foil to overhang at least two sides, so it can be used to lift the fudge from the pan in the end. Spray foil with non-stick spray or lightly coat with butter. 2. Stir together the sugar, butter pieces, condensed milk, and evaporated milk in a 3 1/2 quart saucepan. Bring to a boil, stirring constantly, over medium high heat. Continue to cook, stirring frequently to prevent burning, until a candy thermometer reaches 234 degrees F (soft-ball stage). The thermometer will shoot up to around 224 rather quickly, but it can take up to 20 minutes to slowly climb the remaining 10 degrees. Be patient, stir frequently, and keep your burner set the lowest setting of "high" to maintain a boil, but prevent burning. 2. Immediately remove pan from heat. Remove thermometer. Stir in the white chocolate until it has melted and incorporated completely. Next, stir in the mini marshmallows until they have melted and are thoroughly incorporated. The mixture will be quite thick. Lastly, stir in the rum and nutmeg. 3. Pour mixture in to prepared pan. Cool for 15 minutes. 4. While fudge is cooling, prepare the ganache by placing the chocolate in a medium bowl. In a saucepan, or in the microwave, bring cream to a boil. Pour boiling cream over the bowl of chocolate. Allow to sit for 2 minutes. With a small whisk or fork, gently bring the cream and melted chocolate together until thoroughly combined, smooth and shiny. 5. Pour chocolate ganache over the fudge (which will be warm, but will have set by now). Use a small offset spatula to smooth and level. 6. Cool for 10 minutes, then sprinkle lightly with ground nutmeg for garnish. Allow the fudge to continue to cool, on a baking rack, until it comes to room temperature. Refrigerate for at least 3 hours. 7. 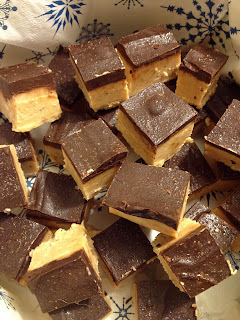 Lift fudge from pan by the overhanging foil. Gently peel back and remove the foil. With a sharp knife, cut in to 1" squares. Wipe knife in-between slices to keep pieces looking neat and clean. It is easiest to cut the fudge when it is cold. 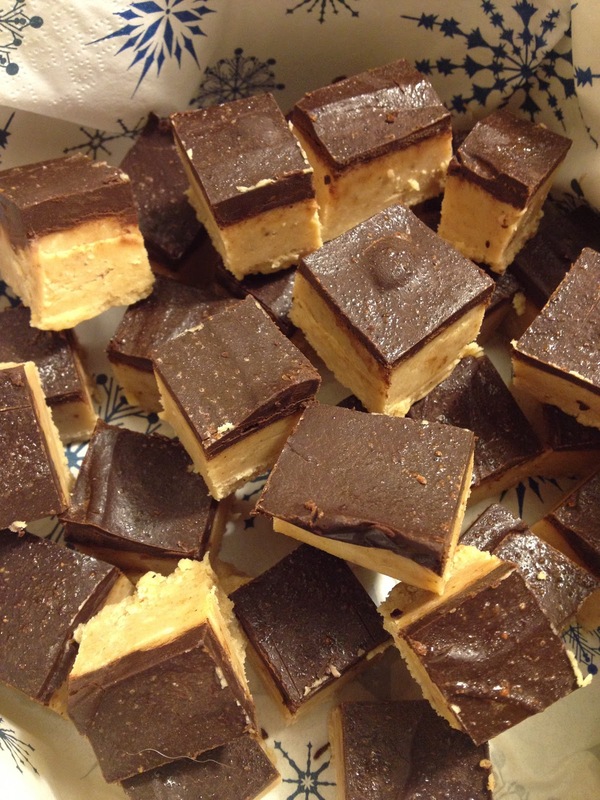 Store fudge in the refrigerator, tightly wrapped for up to 2 weeks. Best when served at room temperature.